Seek out diversity in every element of your staff. For international staff, hire from different countries and different regions of the world. That way, if one country presents a problem in terms of visas, you won’t lose half of your counselors. Seek Out Staff With a Range of Skills. Finding a horseback-riding specialist is great, but finding a horseback-riding specialist who can help out in arts and crafts is even better! Keep in mind that you may need to do some shifting of responsibilities at first, before staff become comfortable with their roles. Prepare your staff for this possibility as well! Unanticipated embassy issues can delay the visa process for weeks or even months at a time. Do not wait until a month before your camp opens to start looking at the holes in your staffing. Also, if at all possible, plan for more staff than you need. We recommend that you be over prepared, as appropriate candidates may not be available if you find you’re understaffed after your season has started. Think Carefully About Start Dates. Plan to bring international staff to camp a few days early. If everything goes smoothly, you will have some extra help opening up camp, and your staff will have a few days to adjust to their new surroundings. If there is any sort of glitch and someone must arrive late, you have given yourself a time cushion. Visas Can Be Tricky. The only person who determines whether or not a certain participant gets a visa is the consular officer in that particular Embassy/Consulate on that particular day. You provide the job and InterExchange provides the paperwork and support for every application, but the Embassy alone makes the final decision on whether to grant a visa or not. InterExchange can never guarantee that an Embassy/Consulate will grant a participant a visa. Life Is Unpredictable! It sounds trite, but mentally preparing yourself for last-minute challenges may be the most important thing you can do. If you are able to remain calm and maintain a sense of humor in a potentially challenging situation, your staff will follow your lead. InterExchange Is Here for You. Our team is always here to provide you with guidance and suggestions for improving your experience hosting international participants. In addition to helping you manage the cultural learning and exchange process, we also provide the necessary support for your staffing needs. 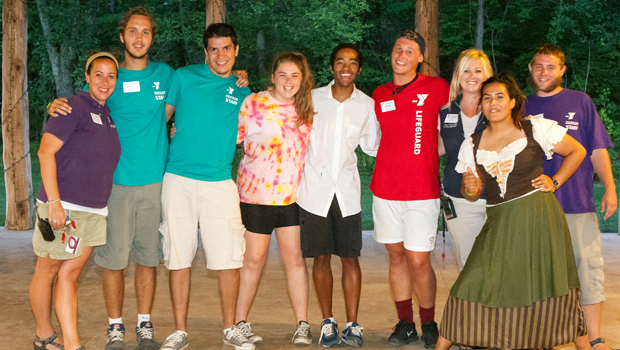 As camp program professionals, we understand what can and cannot be done at the last minute. Whenever possible, we will assist with replacements or additional staff. Most importantly, we will provide you with an honest analysis of the situation, as well as a realistic picture of how we can help. Hiring a diverse group not only helps you avoid visa issues but also allows your staff to improve their English as they communicate with one another. Continue to the next chapter, Camp Roles & Responsibilities, or return to the Table of Contents.